The ecliptic and the Zodiacal constellations. How the planets appear to move against the night sky. Use of the Helios outside at night - where should the stars appear in the sky? Rotation of earth on its axis and moon revolves it every 29.5 ‘days’. It will also show months,seasons and pattern of tides. Demonstration of varying length of day by creating shadows. Identification of the pole star and others from different positions on earth. 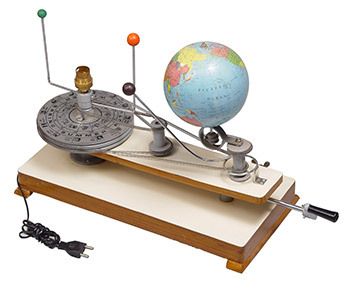 This apparatus demonstrates the relative movements of the Sun, Earth and Moon. Thus causes of various phenomena can be understood such as seasons of the year, day and night, changing length and direction of different shadows, seasons, phases of the Moon, eclipse etc. 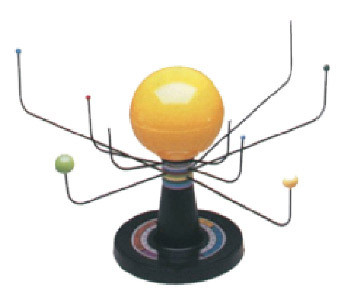 An illuminated three dimension model of the Sun and planets teaches planet identification, sizes, distances and colors. The planets may be set by month to show their relative positions. A sturdy base supports the 6-in. diameter Sun with the outer planet 18 inches from the Sun. Illustrated study guide includes planet position tables. All plastic, with electric fitting to illuminate the Sun.